www.vhemt.org ~ The Voluntary Human Extinction Movement: This site promotes the concept of living long and dying out. According to the site, phasing out the human race by voluntarily ceasing to breed will allow Earth’s biosphere to return to good health. Crowded conditions and resource shortages will improve as we become less dense. 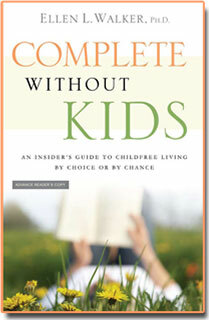 www.childfree.net ~ book reviews and websites on the childfree lifestyle. www.happilychildfree.com ~ an up-to-date site that discusses the subtypes of childfree adults and provides a list of resources for those in each category. www.childfreebychoice.com ~ a childfree online community with lively forums, member blogs and articles sharing personal experiences as well as advice. www.idonotwantkids.com ~ the world’s only childfree dating site. www.nokidding.net ~ this group has been around for years, promoting social opportunities for singles and couples who don’t have kids. Mother Jones June 2010: Who’s To Blame for the Population Crisis? A Selfish Life by Marisol Schowengerdt (www.aselfishlife.com) ~ A Selfish Life is a fictional, semi-autobiographical novel, which tells the story of four women trapped in a world of painful choices regarding pregnancy and children, and their decisions are driven by each of their unique circumstances, reasoning and religious beliefs. Two is Enough: A Couple’s Guide to Living Childless by Choice by Laura Scott ~ Two is Enough is filled with interviews of couples who chose to not have kids.